Can’t attend the live webinar? Register to watch the online presentation on-demand. Learn more about AHEAD at www.ThinkAHEAD.com. This webinar will highlight how to successfully deliver a holistic approach to IT Infrastructure with an emphasis on speed, simplicity and security. Together, AHEAD and Puppet will discuss the challenges that arise when transforming how and where you run your infrastructure and applications. With AHEAD’s Enterprise Cloud Delivery Framework, and Puppet’s automation platform that offers greater agility and faster provisioning, customers can feel confident they have the right security and tooling in place for their application and infrastructure deployments. One of the core pillars of the AHEAD Public Cloud Operating Model for Azure is ensuring you have a storage and backup solution. Often, our customers have a hybrid environment consisting of on-premises and Microsoft Azure workloads. As such, they need to look at their backup management holistically. In this webinar, AHEAD, Rubrik, and Microsoft will give you an overview of what’s required in a modern data backup solution for Azure. We’ll cover the use cases for backup and DR, VM conversion, and backing up workloads running in Azure. We’ll also discuss when Azure backup makes sense and when you need to move onto a modern hybrid backup solution—and then show you how it all works through a series of demos. Register for the webinar on June 26, 2018 at 10 a.m. CDT to start modernizing your hybrid cloud backup. Unable to attend the live online event? Register to watch the webinar on-demand after the presentation has concluded. Join AHEAD for a live webinar with Solutions Principal Nick Colyer (AHEAD) and Sr. Solutions Engineer Adam Cavaliere (HashiCorp) to learn how to get started automating Microsoft Azure in the enterprise with Terraform. Nick and Adam will walk you through the basics of the Terraform, benefits and use cases, along with key features of HashiCorp’s popular Infrastructure as Code automation tool. Stop using manual and often error-prone deployment and infrastructure management processes—and start creating reliable, repeatable, and automated deployments. Register for the webinar on June 7, 2018, at 1 p.m. CDT to uncover the benefits of utilizing Terraform with Azure. vSphere 5.5 reaches End of Service Life in September, and if you’re unprepared, your IT environment will take a hit and your business could suffer unforeseen costs. Of course, an upgrade to vSphere 6.5 allows you to continue support, but it also offers new capabilities in the area of enterprise cloud management. However, this transition isn’t as simple as “next, next, finish.” In fact, it’s not a traditional upgrade. There are many factors to consider, including your design process, your current and future business needs, and implications for related technologies in your environment. Join our April 17th webinar, The End Is Near, to hear AHEAD Senior Technical Architect Jeremiah Megie talk all things vSphere 6.5, including why you should upgrade, what you have to plan for, and how to execute it flawlessly. IT leaders in the driver’s seat of their organization are constantly focused on the road ahead—including forces reshaping the industry and emerging technology trends. But the road to digital transformation is riddled with blind spots—whether in the form of hidden infrastructure costs or obstructed views of multi-year, total cost of ownership (TCO). Cloud goes far beyond just swiping your credit card and provisioning resources. While true on paper, as an enterprise, you face a different reality when making cloud successful within your organization. How do you unlock the cloud-fueled benefits of innovation and agility while handling compliance, security, and “Day-2” operations? In this 40-minute webinar, AHEAD CTO Eric Kaplan and Solutions Principal Nick Colyer focus on the lessons learned in balancing culture, technology, and process when moving your organization to the cloud. Watch to learn how to avoid key pitfalls in the cloud journey, and ultimately unlock more innovation and agility. Lastly, stick around for a demo of our new managed cloud service, CoPilot, to see how AHEAD can empower your organization to innovate like a startup, but operate like an enterprise. The adoption of public cloud has driven the convergence of service management, security, and compliance at a pace that has made the old rules obsolete. IT execs are under intense pressure to adopt and deliver new and more agile cloud services at a breakneck pace. At the same time, the need for enterprise-grade security, governance, and compliance raises the stakes of innovation at the speed required by the business and the market. Join two AHEAD experts who represent the disciplines of service management and security/compliance, as they discuss how ServiceNow can be used for real-time monitoring of compliance activities and posture, while automating security incident response. These combined capabilities are key enablers to balance security and speed, while reducing the burden being placed on overtaxed IT teams. In this 60-minute webinar, our AHEAD team shares examples of their work at the intersections of ESM and governance, risk, and compliance for a large health system in the southeastern United States. 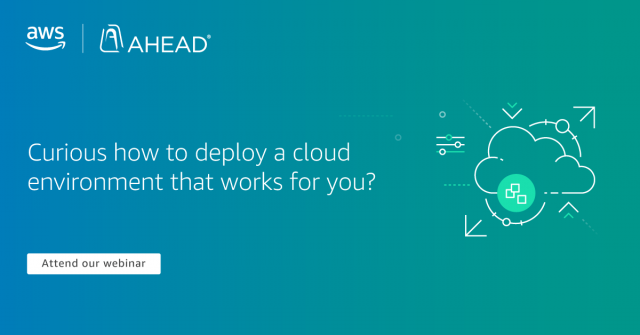 AHEAD transforms how and where enterprises run applications and infrastructure. From strategic consulting, to implementation and managed services, we create tailored solutions at all stages of the enterprise cloud journey. Visit us at www.ThinkAHEAD.com. Title: Straight Talk: When is VMware Cloud on AWS Right for You?